Online Irish passport renewals, which were first introduced in 2017, have now extended to children as well as all adult Irish citizens. Postal applications are still available, as is the rapid renewal service, limited to 30 people a day looking for an emergency document. This expanded service permits the online renewal of children’s passports, introduces a passport card for children, and means that all Irish citizens can now renew their passports online 24/7, from anywhere in the world. With the system, you will need a digital photograph, an email address and a credit/debit card to apply online. To ensure the Passport Service continues to verify the identity of the child and receive the consent of guardians using the online renewal service, a Child Passport Identity and Consent Form will be generated for printing and witnessing at the end of the online process. 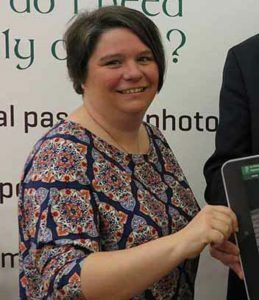 Fiona Penollar, Director of the Passport Service, told Travel Extra: “There’s still a bit of paperwork for children though under the new scheme, to prove identify. For an adult you do it all at home, you don’t need to leave your house. The website has a list of witnesses who might know the family, and they can include a public health nurse, doctor, school secretary or creche manager. Once you have that sorted, it’s a case of posting a label with witness verification and free-posting it to the passport office. And it’s interesting that all ages are going online: “we’ve had one 99-year-old”, said Fiona, and 430,000 people have used the service in total, 200 of them aged over 90. Processing takes up to two weeks, with next day postage delivery in Ireland, from the passport office to your address. “Since 2015 we’ve been on a journey of reform. We’ve been improving our back-end systems, our customer service, we’ve been increasing the protection of the passport and the integrity of it. One of the major projects is the provision of online services. On the 31st of March 2017 we launched online for adults renewing and now the same service for children,” said Ms Penollar.